e-Great and inspiring online meetings play with tools. 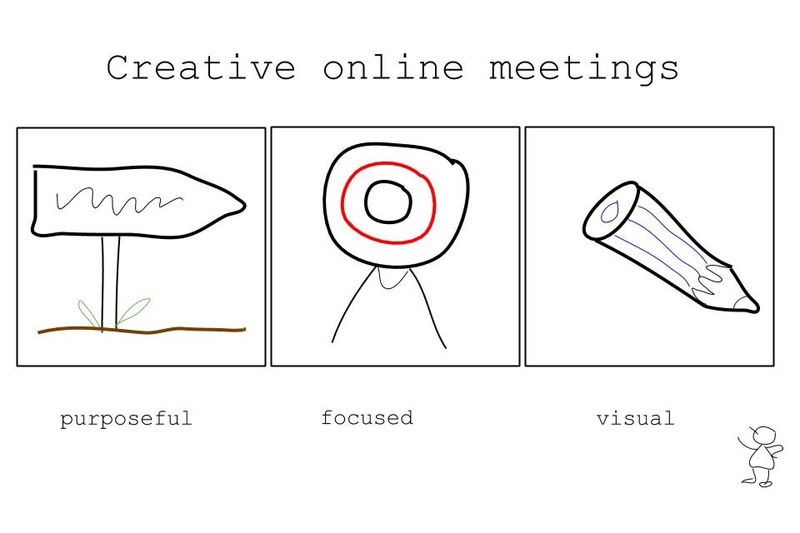 I have many online meetings. Some give me energy boosts and allow me at the same time to get work done; while others are time and energy consuming with poor results. So, what makes online meetings a success? In a personal inquiry, I discovered my three criteria for productive online meetings: A clear purpose, focused conversation and the opportunity to visualize. Meetings always have a purpose. And whatever this purpose is, it must be clear to everyone involved before the meeting: Why do we meet; and what do we want to achieve? A virtual coffee chat to catch up and connect is a legitimate purpose. Only with clarity of purpose I can have a satisfying feeling at the end of the meeting. In online meetings, I prefer to focus on one task or to have a conversation that turns around one key question. I rather have a short focused meeting; and at another time another meeting dealing with a different question. It is motivating and rewarding to build something together; and this is more likely to happen with a focused conversation. I am a writer. I love doodling. I feel somehow handicapped in online conversations when I don’t have the opportunity to draw. Only telling doesn’t work for me. What we do in face-to-face meetings, grabbing a paper and pen and explaining what we mean, is also possible online. And my online experiments with drawing on Google draw tell me it works fine; visualizing is clarifying; it triggers immediate feedback. It helps creating a joint understanding fast. Visuals show where people agree or disagree, and where things are broken, so people can get on the same page and fully understand the same message. When people understand the same way as their co-workers, they can take action. In my experience, productive online meetings can almost be like a face-to-face meeting. The trick is combining tools and playing with these tools. A Skype meeting with joint planning with Google doc: it is productive, everyone writes or sees what is being written and can make suggestions. What are your experiences with online meetings?